I love this little box. I used the Sizzix box #2 die. How cute is it? One of the first sets of paper I purchased from SU was the Bella Rose paper. I felt a little need to use if yesterday and made 2 of these boxes. They'll be handy for a teachers gift with some treats inside. If you would like to purchase any of the products I use please visit my on-line store Here. 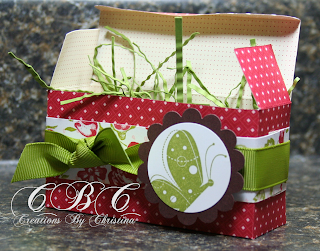 Card Recipe products (c) Stampin' Up! Love your videos. You make beautiful cards. Thanks for doing this.